Chapter 2: Monday. Where Did They all Come From? He starts with asking you how you might handle a typical discipline situation... a tongue lashing? Ignoring it? Trying something new and revolutionary that will take this behavior and "nip it in the bud" for good. Like Love and Logic Dr. Leman encourages experimenting a little with this new technique that includes being a parent with a back bone, using consistency and follow-through, and not backing down. 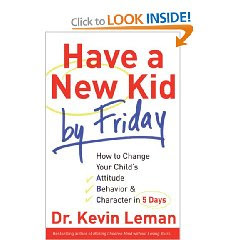 As he has in other books... what Dr. Leman suggests is keeping your cool and without warning or threats, "pulling the rug out from under" the child (figuratively of course). 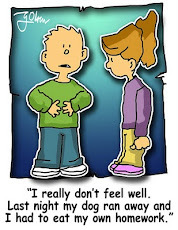 He uses the example of Matthew who had misbehaved in the car and then came home expecting his usual cookies and milk. Mom however, said, "Were not having cookies and milk today because Mommy did not like the way you talked to me in the car." She was prepared for the subsequent melt down but still did not give in. When Matthew apologized and asked if he could have his cookies she gave him a hug and said that no he couldn't but not to worry, they could have them tomorrow. Changing your behavior as a parent will not be easy but this chapter goes on to give great advice on how to start. 1. Observe what's going on in your house and think about what's really bothering you. 2. Think about how you'd like to things to change. 3. Decide to take the bull by the horns... (Remember....the bull is you not your child!) 4. Expect great things to happen.